This recipe comes from the Hashknife Outfit of Winslow, Arizona. Enough cornmeal to make a beatable batter. Mix starter, cornmeal, milk, eggs and stir thoroughly in large bowl. Stir in melted butter, salt and soda. Pour into a 10 inch greased frying pan or Dutch oven, and bake for 25 to 30 minutes. 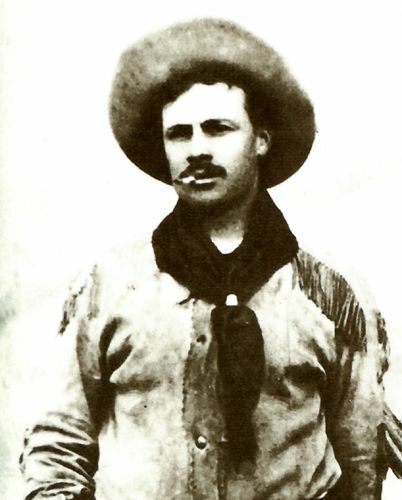 Cowboys are noted for developing their own vocabulary, known as Cowboy Slang. Sometimes it was because they couldn’t pronounce the word correctly as used in the language of origin. They were famous for perverting Spanish words. Cowboys also named items because the item reminded them of something else. However they came about, cowboys had a vocabulary that was colorful and their own. Below are some cowboy slang words used in reference to chuck, or for the non-cowboy, food, while they were on the trail. Calf Slobbers – Meringue on a pie. Fried Chicken – Bacon rolled in flour and fried. Chuck Wagon Chicken – Fried bacon. Charlie Taylor – A substitute for butter. A combination of molasses and bacon grease. Spotted Pup – Cooking raisins in rice. Stacked to a fill – Compliment to the chief following a great meal. Dry Camp – A camp that has no water available. Prairie or Mountain Oysters – Calf’s testicles. Sourdough biscuits were a delicacy whether on the trail or at the ranch. Once a cook got a good sourdough starter he cherished it like a baby. On the trail he would store it in a dark, cool place in his chuck wagon. Here is one cooks recipe for a sourdough starter. 2 cups of lukewarm potato water. Make potato water by cutting up 2 medium-sized potatoes into cubes, and boil in cups of water until tender. Remove the potatoes and measure out two cups of the remaining liquid. (The potatoes can be used for the evening meal.) Mix the potato water, flour and sugar into a smooth paste. Set the mixture in a warm place until it doubles its original size. Boil sweet potatoes until well done. Peel and slice them very thin. Line a deep pie pan with good plain pastry, and arrange the sliced potatoes in layers, dotting with butter and sprinkling sugar, cinnamon, and nutmeg over each layer, using at least ½ cup sugar. Pour over 3 tablespoonfuls whiskey, about ½ cup water, cover with pastry and bake. Serve warm.